Art Wall Japanese Bridge 14 by 18-Inch Flat/Rolled Canvas by Claude Monet with 2-Inch Accent Border@1640 Rs [Mrp:-1640] - Onlinedeals.discount - A leading product discovery website. Find the true prices of products, read reviews and buy top brand products at reasonable prices. Reproduction is completely made in the USA; printed on high quality canvas and rolled into a Free corrugated Kraft tube. 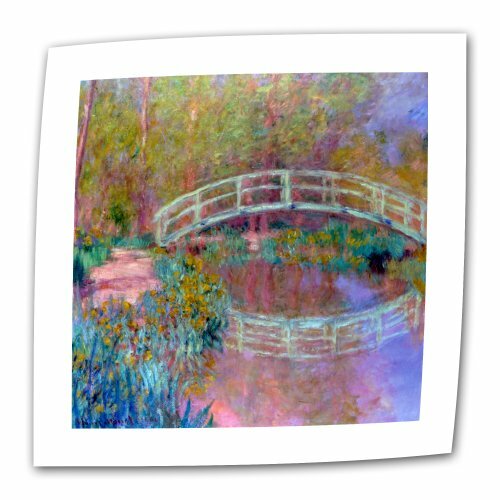 Cmonet20-14×18 Size: 14″ H x 18″ W x 0.1″ D Features: -Wall art.-Artist: Claude Monet.-Title: Japanese Bridge.-Type: Rolled flat canvas.-Printed on high quality canvas and rolled into corrugated kraft tube.-Made in the USA.-14-in: 14″ H x 18″ W x 0.1″ D.-18-in: 18″ H x 24″ W x 0.1″ D.-24-in: 24″ H x 32″ W x 0.1″ D.-36-in: 36″ H x 48″ W x 0.1″ D, 2 lbs. Collection: -Claude Monet collection.